Spring wasn’t destined to last. Further evidence that August is a month for upheavals. On the 20th of August in 1968, during the early morning hours, residents in Prague and outlying areas were awakened to the sound of rumbling tanks and squadrons of MIGs. In one swift move, Moscow decided Prague Spring and Socialism With A Human Face had done enough and it was time to restore hard-line Soviet influence in Czechoslovakia. So, in addition to Moscow, troops from other Soviet Bloc countries joined in and the country was quickly overrun and the shockwaves reverberated throughout the world within hours. With 1968 already a year bathed in violence and protest, this new episode just added to the jitters the world was undergoing. How the year was going to end up was anybody’s guess. And the guesses weren’t optimistic. Here is the first hour of bulletins as they were broadcast from around 10:00pm (PDT) on August 20th via CBS Radio and their (relatively) new Netalert service. Scary times – and no wonder people were tuning out at an increasing rate. Reality was becoming to hard to handle. 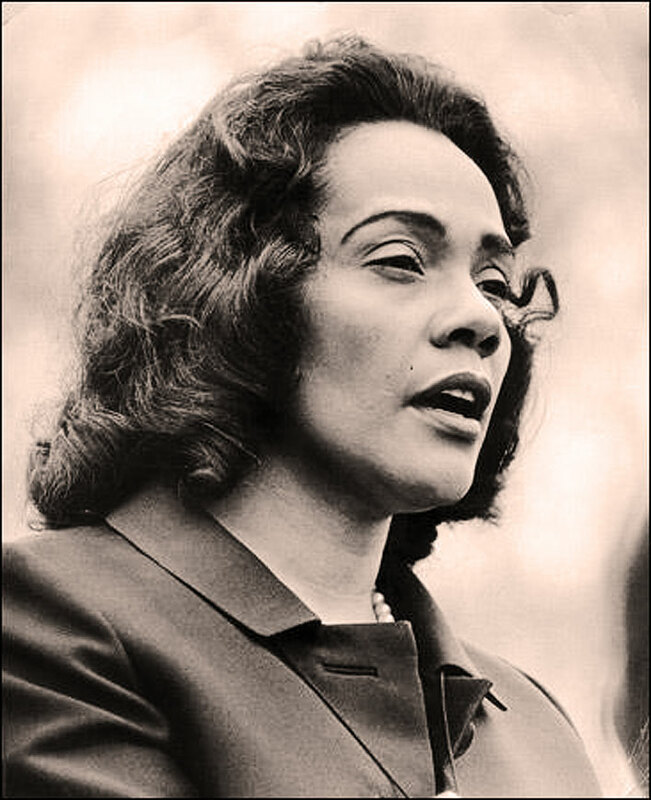 Coretta Scott-King – fulfilling a legacy. 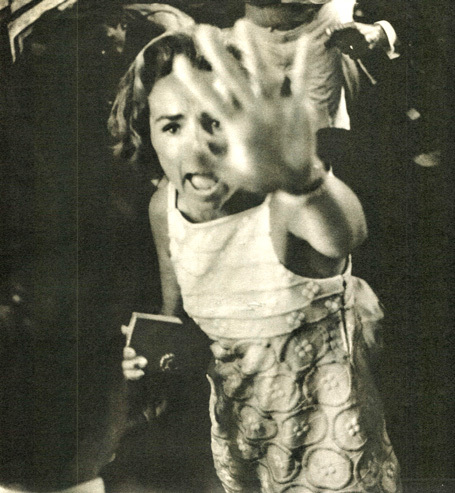 1968 saw no end of turmoil and upheaval in the world. In the first six months alone there was the Tet Offensive in Vietnam, the assassinations of Martin Luther King and Robert Kennedy. France went on strike. Prague Spring was looking tenuous and Washington D.C. was playing host to a gathering of the nations poor and the construction of Resurrection City on the Washington Mall. Part of The Poor People’s Campaign. It was the last movement to be organized by Dr. Martin Luther King. It was designed to not be a sit-in, but rather a live-in. A gathering of Poor People of all races and locations throughout the country to meet in Washington and bring attention to the nations plight, by setting up some 3,000 tents on the Mall. June 19th (Juneteenth) was declared Solidarity Day, and a rally was held, attracting between 50-100,000 people. Addresses were made by Ralph Abernathy, Hubert Humphrey, Eugene McCarthy, Walter Reuther as well as Coretta Scott-King. Sadly, the rally would be the last show of public support for the Campaign. Since it was an election year, the political ramifications were many. Humphrey, who spoke, was roundly booed by the crowd, while Nixon urged Congress not to give in to the Campaign’s “demands”. The next day, on the 20th, Police fired several canisters of tear-gas into the camp after alleged reports of provocations by protesters. Further reports claimed the encampment had been overrun by escaped mental patients. And by the 23rd of June the permit issued by the city had expired and the city was soon dismantled. In a year rife with protest and violence, the dismantling of Resurrection City didn’t seem that surprising and the ensuing violence didn’t seem that unusual. Strangely, we were starting to get used to it. Here is a 30 minute extract of Coretta Scott-King’s Solidarity Day address, as given on this day, June 19, 1968. In the midst of celebration . . . chaos. Forty-five years ago today, America was hanging on hourly reports from Good Samaritan Hospital over the condition of Senator Robert F. Kennedy, gunned down on his way out of a celebration in honor of his winning the California Presidential Primary only a few hours earlier. As news spread regarding the events in Los Angeles, a sense of crushing familiarity became apparent – Martin Luther King had been cut down by an assassin less than two months earlier. Bobby Kennedy’s brother President John F. Kennedy had been cut down by an assassin only five years earlier. 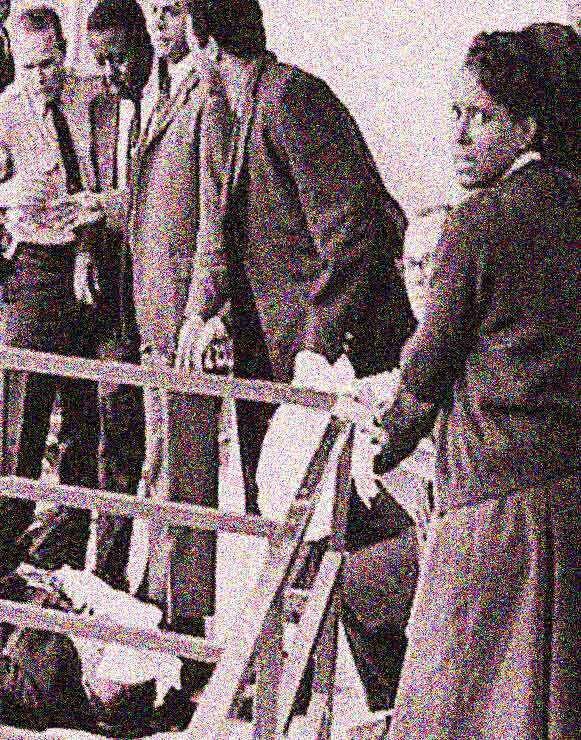 And five years to the day since Civil Rights worker Medgar Evers was cut down by an assassin in the driveway of his home. America was in the grips of killing public figures. America was in danger of spiraling out of control. While President Johnson ordered Secret Service protection for the remaining candidates in this Presidential election year, hopes were pinned on a complete recovery for the Senator. And at the time of this broadcast (7:30-8:30 am PDT), Robert Kennedy was reported to be in stable condition, having just come out of several hours of surgery. At the time there were hopes for recovery, but fears the wounds would result in permanent brain damage persisted. But at 7:30 on the morning of June 5th 1968, no one knew. But people were too much in shock to speculate. We just wanted everything to be okay. Here is that complete hour, uncut from local radio station KFWB-AM in Los Angeles (having just switched to an all-news format only weeks earlier), as it happened on June 5th 1968. A palpable sense the show would be over soon. A Presidential Press Conference for this May 30th in 1968. 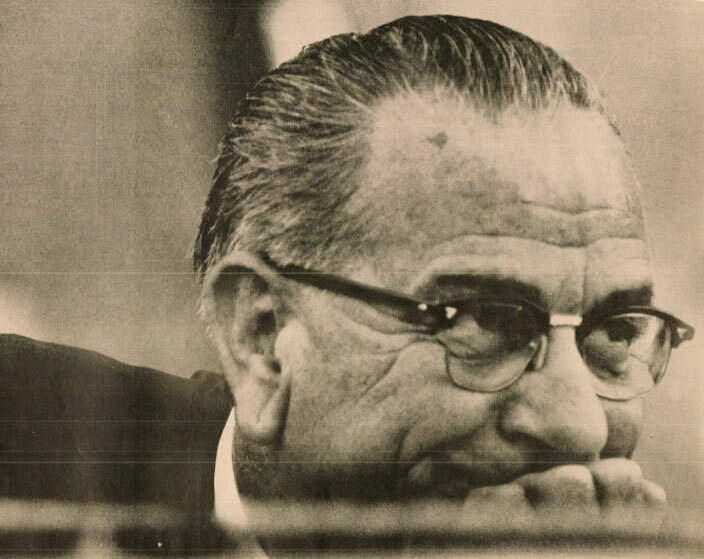 President Johnson, mindful of his declaration in not seeking another term for the 1968 elections, was still confronted with the seemingly endless war in Vietnam. Joining him in this press conference were Gen.Westmoreland, who gave an assessment of what he thought was going on in Vietnam since the last Press Conference (and knowing now that the numbers of dead/wounded were inflated/deflated now make those assessments ironic) and Australian Prime Minister John Gordon who was paying a visit to the White House for a meeting regarding the situation in Vietnam. The press conference was held at the Johnson Ranch in Texas and, after some preliminaries, the subject turned to Vietnam. You get a sense Johnson was relieved to be dropping the White House burden at the end of the year. Vietnam became his nadir. As it did for just about everyone else. Here is that news conference in full, as broadcast by NBC Radio on May 30, 1968. That unmistakable feeling of falling through the abyss. Forty-five years ago today. Not that long ago, considering. On April 4, 1968 – late in the afternoon here in Los Angeles, but early in the evening on the East Coast, word flashed across every news wire and every segment of the airwaves filled with reports that Civil Rights leader Dr. Martin Luther King had been gunned down on a balcony of the Memphis Motel he was staying in, preparing to lead a march of striking Sanitation Workers in the coming days. Dr. King was pronounced dead at the scene. The news and the reaction were swift. Disbelief, shock, sadness, rage – a volcano of anger; all the emotions wrapped up in a single moment. Here are two recordings from that day and the day after. The first is, what was to have been a campaign address by Robert F. Kennedy, where he is informed of the assassination just as he is about to speak. The second is a CBS Radio News Special Report from May 5th, chronicling the anger and rage, spiraling into acts of violence immediately after the news was learned. Many people have said that 1968 was the year the country almost fell completely apart – we were on the brink of anarchy and it was wondered if we were going to survive. Listening to this event unfold, you get some idea how real we actually felt that possibility was. But at the time, we were too stunned to think beyond minutes. We just watched it all unfold and shook our heads.